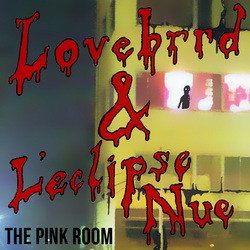 Lovebrrd & L'eclipse Nue - "The Pink Room"
This is a split release featuring Lovebrrd (U.S.A.) and L'eclipse Nue (Japan/U.S.A.). It is released in a limited edition of 20 beautiful, gold-colored, professionally duplicated cassettes. The j-cards are hand-made, and individually numbered.